Mysid Shrimp - are they in your tank?Often confused with larval offspring of many popular ornamental shrimp, some of the more interesting creatures that populate marine aquariums are from the order Mysidacea, the mysid shrimp. Much like other beneficial microfauna in our aquariums, they seem to spring up out of nowhere and represent a valuable natural food source for fish and invertebrates in our systems as well as occupying the important niche of helping to keep our systems clean.Without venturing into the debate of feeding freshwater food sources to marine animals, mysids are not as well known as their freshwater counterparts, mysis shrimp. 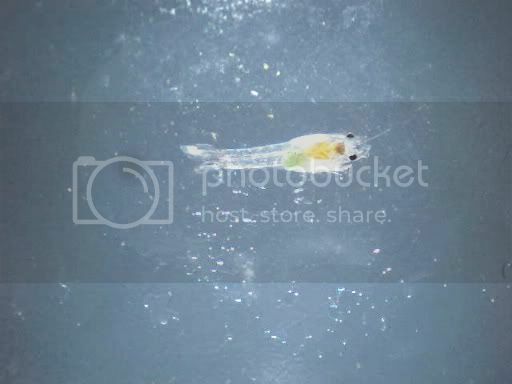 Many companies harvest freshwater mysis shrimp and freeze them for sale to aquarists. They are a protein rich food and will help many finicky eaters to begin eating, hence their popularity. Mysids, however, are not typically sold as a frozen food and are available typically only through some of the larger mariculture facilities as live food. The ones that are typically available through these suppliers are larger than the ones commonly found in our aquariums, typically reaching sizes of up to an inch.On the other hand, the ones that we typically find in our aquariums seldom reach a size of more than 1/4" and are typically no larger than 1/8" or smaller. 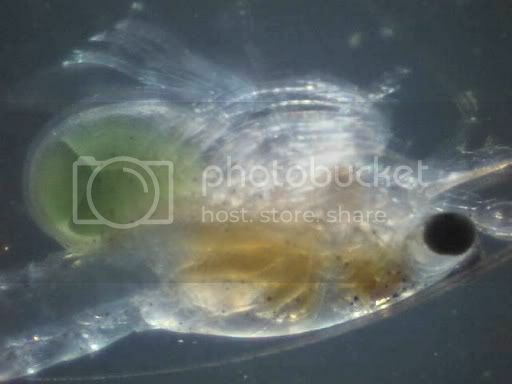 Often what we see are tiny silver streaks that dart back and forth in the dark recesses of our aquascaping, in tiny caves within our rock, in sumps, refugiums, and overflows, and wherever there are either no predators to eat them or there is sufficient cover to allow them to survive. 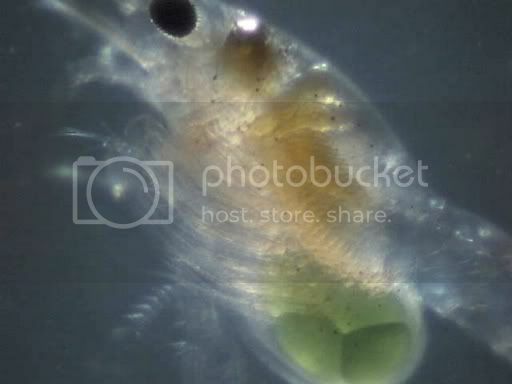 While relatively transparent, they can be readily identified by the presence of two fairly sizable black eyes located at the tips of eye stalks that don't extend far past the carapace. Since the eyes are black and body is typically silver or clear, the eyes really stand out and are a telltale sign that you've got mysids. 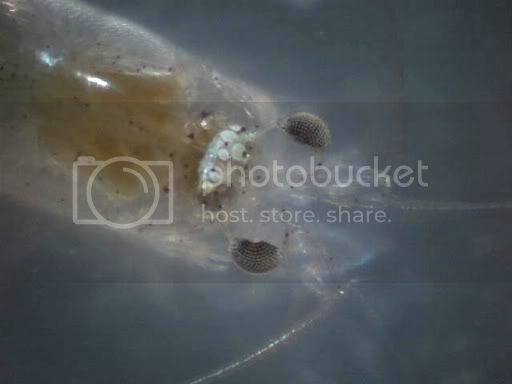 The compound eyes of the mysid shrimp are clearly visible here. 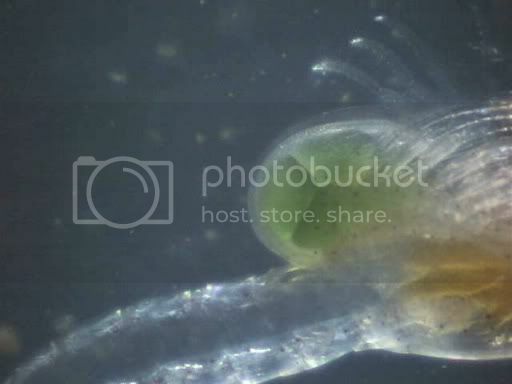 Notice they do not protrude out far from the carapace and have relatively short eye stalks.Mysids are a typical shrimp in that they have a head and thorax that are fused together into one piece and then have a segmented abdomen or tail. 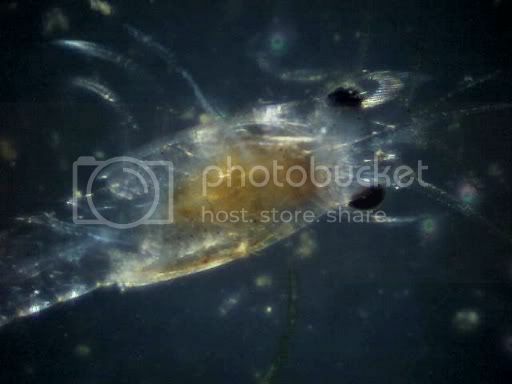 Their body structure is the same as most shrimp that lack any prominent claws. Their telson (tail spike) is not especially long and in the ones typically found in our tanks the uropods (fan-like "fins" on the tip of the tail) are often longer than the telson. This picture shows the lack of any prominent claws used for predation or as a deterrent to predators. 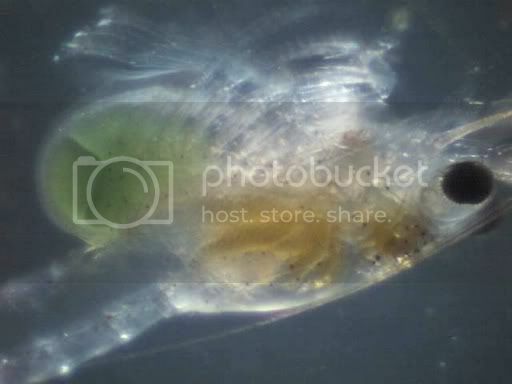 The head and thorax of the mysid shrimp are fused together into a single body part to which are attached the legs. Mysids have two body parts, a fused head and thorax and then the abdomen, or tail, seen here. The tip of the tail is where the telson and uropods are located. Notice the telson is shorter than the uropods.Where they tend to differ from the ornamental shrimp we put in our tanks is that they have an elongated body and their tails tend to be straight or sometimes even curve upwards instead of curving down in my experience. The typical ornamental shrimp is a benthic organism that spends much of its time walking around on its feet, scooting backwards to avoid predation and conflict. Mysid shrimp, though, are more similar to pelagic shrimp like krill except that they don't jet backwards but scoot forward to escape. They are constantly on the move and rarely settle down to the bottom for more than a few moments. Despite this resemblance, the ones we have in our tanks are in fact benthic although there are also pelagic species out there. The tail of this mysid curves up towards the telson, different from the typical downward curve of the tails of typical benthic ornamental shrimp. Notice the legs that are swept forward - in some species they use these abundant legs to collect detritus or other food particles which are then swept from the legs to the mouth. This female mysid shrimp is carrying embryos in its brood pouch, or marsupium, hence the common name opossum shrimp. When mature, the juveniles will be released and then new eggs will take their place.Mysids consume a wide variety of foods and typically the varieties we see in our systems are consuming algae, detritus, and capturing microfauna smaller than them. As omnivores and detrivores, they help to keep our tanks healthy and maintain a good balance in our closed systems. Typically, once established, they are present in far greater numbers than are seen. The young are as small as many of the pods we often see (or don't see!) in our systems and hide as they are often eaten by their parents.So, next time you see a tiny silvery flash darting back and forth as you sit in front of your tank shining a flashlight into cracks and crevices in the rockwork (and you know we all do that! ), chances are you've spotted a mysid shrimp! 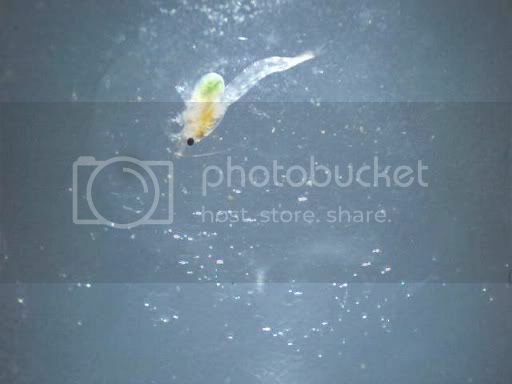 Click on the thumbnail to see the full body of the mysid shrimp from above. Click on the thumbnail above to see how the mysid moves forward instead of curling its tail to escape backwards. Click on the thumbnail above to see how the mysid's legs help it to swim forward instead of walking around or scuttling backwards as typical ornamental shrimp do. Unbelievable pictures and videos. What are you using to take pictures? I have seen these in my tank. They are tiny. I tend to get more critters in the overflow and sump, but I have seen them in the main tank also. 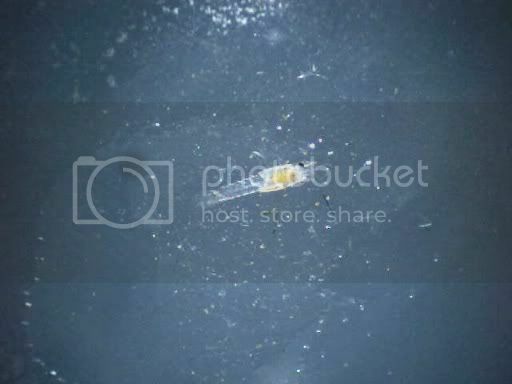 If you look at the tank at night with a flashlight and shine it into the tiny holes in your rock you'll probably see them darting back and forth. 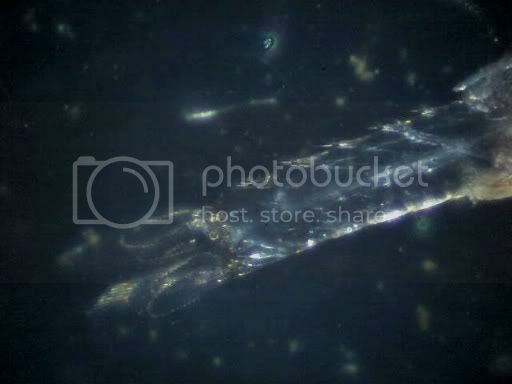 I used a Digital Blue QX5 microscope for the captures. I think most of them were at about 60x magnification (the 200x is just too grainy). It's a pretty useful microscope for a school setting and things like this. We use it to look at things all the time at school and the kids can use it without any help and then broadcast images with a projector so that they're several hundred times larger.